Founded as Docutek Information Systems Inc. in 1995, Docutek, a SirsiDynix Company, is a leader in e-learning collaboration and communications solutions for K-12, higher education, and libraries. From their academic roots, our founders - a professor and the university library's Webmaster - brought to Docutek more than 40 years of experience applying technology to teaching and learning. Today our systems are available to more than four million library patrons, including three and a quarter million students, worldwide. We are dedicated to playing a significant role in advancing education by helping librarians, college instructors, K-12 teachers, students, and parents to tap into the power of today's rapid advance in technology. Docutek was acquired by SirsiDynix Corporation in January of 2005. SirsiDynix is an innovator of technology focused exclusively on meeting the ever-changing needs of libraries and library consortia of all types and sizes. SirsiDynix develops, sells, and supports a comprehensive integrated suite of software solutions for meeting the information management and sharing needs of libraries and library users around the world. SirsiDynix and Docutek continue to pursue our common interest in e-resources and e-learning, and the library community. Docutek offers technology solutions for learners of all ages. 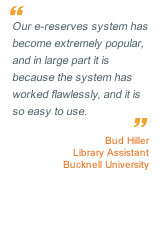 At the core of Docutek's mission is providing innovative technology to college and university libraries. Our flagship product, Docutek ERes - the first standalone, Web-based electronic reserves system - is the standard for libraries offering reserves on the Internet. And Docutek VRLplus, our virtual reference system, lets patrons work online with their local reference librarians. In evaluating Docutek and our products, customers cite our commitment to libraries and to education, and our responsiveness to the community's needs. Since our founding we have relied heavily on librarians, professors, and teachers to guide product development. Docutek is also frequently praised for our superlative customer support, and for providing systems which are at the same time powerful, easy to learn, and easy to use.